I am curious what Atari recommended to users as an appropriate monitor for their 8 bit computers (400/800/800xl/etc). For example, my Commodore 64 pairs nicely with a Commodore manufactured 1702 or 1802 monitor. Likewise, my Amiga pairs with its 1080 or 1084. Even my Apple //e has a corresponding (green) monochrome monitor manufactured by Apple. I don't think Atari made monitors until the ST came along, which makes me wonder what a user would do when the TV just wasn't cutting it anymore? I'm using my Amdek Color-I right now, but I'd like to find a better pairing for my Atari. Did Atari ever recommend a brand or model of monitor? Without getting opinion based, did a de facto standard evolve among Atari users of the period? I don’t think they ever recommended a monitor. As far as I can remember, Atari communications showed Atari computers on their own, or connected to TVs; see for example this 1200XL advert, and Atari UK’s magazine, Atari I/O (issues 2, 3, 4, and 5). At least in Europe, 8-bit Ataris produced nice video on most TVs (I didn’t grow up with NTSC so I don’t know how bad US TVs are for computer use). I don’t know whether a de facto standard ever emerged. As others have said, Atari didn't recommend a monitor as far as I'm aware, but I can confirm S-Video on a Sony PVM looks fantastic. Atari marketed their computers in nice consumer packaging, at retail stores like Sears and Service Merchandise. The box packaging featured pictures of a full lineup of nicely matching peripherals, including a variety of printers, a disk drive, modem and a monitor. That was in 1985 and beyond, when their last line of 8-bits, the XE series (eXtended-Eight-bit) were released. The new fashion was a sporty cool-gray. Important Background: The NEW "Atari"-- Jack Tramiel had been ejected as CEO of Commodore for cutting prices of the C64 too drastically. So he formed a private company to design new computer hardware using the Motorola 68000 processor. He had brought Commodore design folks to work on it, purportedly with plans in hand. At that time, Atari was owned by Warner Brothers. The folks at Atari had also been designing a new 16bit 68000 based computer, called the "Atari 1850XLD", which featured a lot of custom circuitry, and was under heavy development. But due to emergency financial troubles Warner Brothers had to sell them off at a throwaway price. Tramiel then purchased Atari. The "Atari 1850XLD" staff were not retained, with Tramiel deciding to use his "Commodore" staff and plans. However, those left-out employees from the "Atari 1850XLD Project" formed their own company called "Amiga", to bring it to market. Tramiel then decided he wanted to purchase "Amiga", fearing it would compete against his ST. HCommodore swiftly purchased Amiga in a surprise move, though. 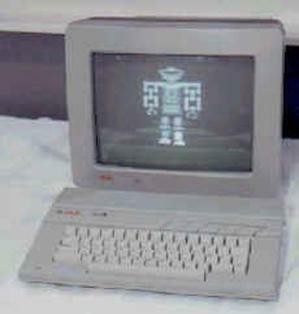 That left Tramiel to restart his own Commodore-era designs as quickly as possible, and at "Rock Bottom Price" in oder to beat Commodore to market. They used as much off the shelf components as possible for the "Atari ST" (standing for S.ixteen-T.hirty-two). After battling in court with Commodore, Tramiel won a years delay for Commodore. It was then that they formulated the idea of marketing a matching Atari 8-bit computer monitor. However there were a lot of 8bit peripherals left in stock to sell off, and so they planned to bundle those with the freshly styled XE computers first, and then later manufacture cosmetically matching peripherals, including new monitors for the XE. The new styling was shown off at the International Winter Consumer Electronics Show (CES) in Las Vegas, Atari previewed/announced: [color] XC1411 monitor and [monochrome] XM128 monitor for the XE line. Only a few demonstration units were produced, none shipped commercially. Their new tagline, 'Power Without the Price' was bannered across their booth, which became an advertising slogan for years to come. Their Atari ST adopted the fresh cosmetics, a cool-gray look considered slick and sporty. 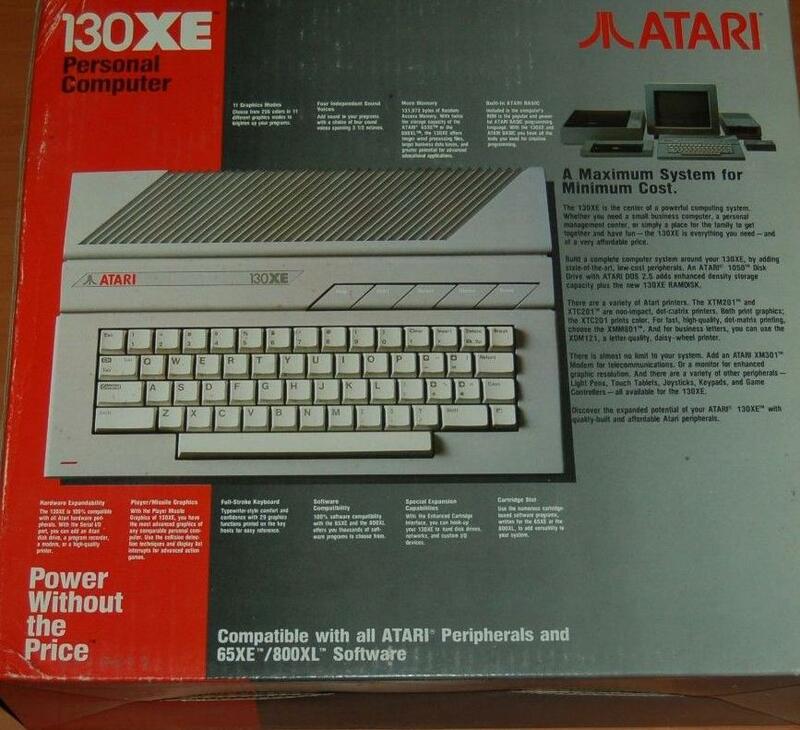 PERSONAL ACCOUNT: My first computer was an Atari 130XE, and it came with an old style 1050 disk drive and 1027 Letter Quality Printer, and also a Sears Monitor (almost a sleek cosmetic match,). 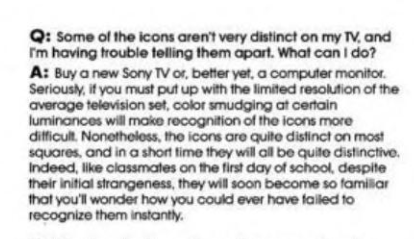 I would go on get an sleek new XM-301 modem and a 8pin XMM801 dot-matrix printer, with the fresh styling. Unfortunately, the 8bit, XE series of Hardware that were never released commercially went on to become known as "Vaporware" and that includes the two previously mentioned XE properly-styled monitors, the XC1411 and XM128 monitors. The original Atari 800 monitor output (5-pin DIN) supports both composite video and S-video. Thus, the Commodore 1702 pairs very well with it, using the Chroma+Luma (S-video) inputs. Same with any other S-video capable monitor. Later versions of Atari 8-bits tended to not support S-video, but are easily modified to provide S-video. I don't think there was ever a "de-facto standard" Atari 8-bit monitor. People tended to purchase the best monitor for the type of software they wanted to run. A spreadsheet and word processor user might prefer a cheap monochrome display over a color S-video display. Sony made a KV1311CR TV that has a digital and analog RGB input. The analog RGB input could be used with an Atari ST via a special cable. It had a 640x480 display. It also has a composite video input and analog audio input that will work with the Atari 8 bit computers. And an atari branded monitor! I have to point out that this was in the Netherlands, but I'm quite certain the monitor was atari branded. The thing is, I used this monitor exclusively back then, to the point that up until recently I'd never actually seen a single atari game in anything other than monochrome. Still, unless my memory is playing some very serious tricks on me, this means at least one dedicated atari monitor exists for their 8 bit line. (monochrome with green phosphors) - given the systems I had it with, and all the other accessories I got with those systems, it's reasonable to assume this is a monitor that dates to the same period as the XL computers, though I have no proof of this. (it also helps that the monitor housing, as far as I remember was beige with dark brown accents - in other words, the same colour scheme as the XL machines themselves.) Unfortunately, unless I somehow get lucky and find a reference to it somewhere else, I guess I can't particularly prove it exists. Update: As some extra information, I'll describe the monitor, and see if it seems at all familiar to anyone. Keep in mind I have no references for it. (pictures, model numbers, etc.). This is entirely going off my memory of things nearly 28 years later. As such it may not be entirely accurate. The display was monochrome green and the overall size was very similar to a 34 cm television we had at the same time. (suggesting a ~13 inch display, but obviously 12 and 14 are in the same bounds.) It had audio capabilities, though I don't remember where the speaker was placed. Not the answer you're looking for? Browse other questions tagged atari crt-monitor or ask your own question. Monitor Cable for Atari 130XE. Where to buy or how to build? How does the 4MB mod for 8-bit Atari work? Why did the Atari 8-bit computers make beeping noises while accessing the disk and cassette drives? What changes made some Atari ST software incompatible with the Atari TT?